Have you discovered Dreena Burton’s blog, http://www.plantpoweredkitchen.com? Or her cookbooks? The Everyday Vegan was her first, written after her father-in-law’s heart attack, followed by Vive le Vegan!, eat drink and be vegan, and Let Them Eat Vegan. 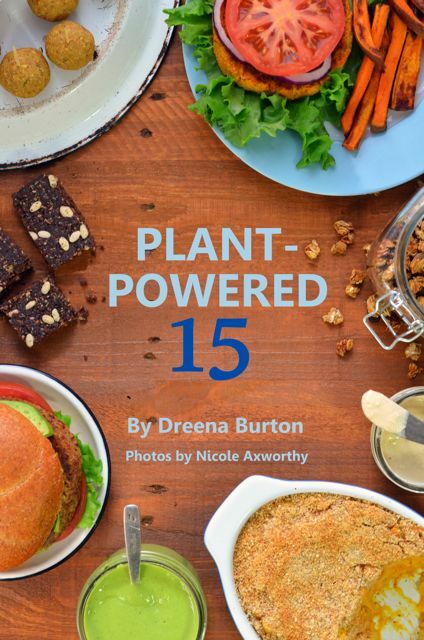 Plant-Powered 15 is her latest. It is an e-book containing 15 recipes, all whole food and oil-free, with gorgeous photos of each. How does Creamy House Dressing, Green Goddess Dressing, Orange-Miso Dressing and Wonder Spread sound? How about Presto Pistachio Pasta, Umami Sun-Dried Tomato and Almond Burgers and Mac-nificent!? And don’t forget dessert. She has included three. 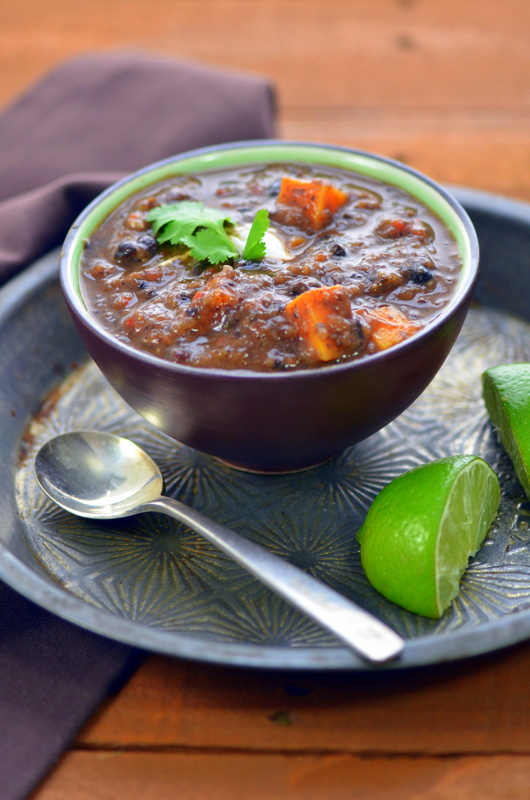 She has let me share her Black Bean Soup with Sweet Potatoes recipe with you. It is so delicious. My husband, Bill, says it’s his favorite soup! At the end of this post, is the GIVEAWAY. In a large pot over medium-high heat, add water, onions, red and green peppers, salt and pepper, cumin seeds, oregano, allspice, and red pepper flakes. Let cook for 5-7 minutes until onions and peppers start to soften. Add garlic. Cover, reduce heat to medium, and let cook another few minutes to soften garlic – if sticking/burning, add another splash of water. After a few minutes of cooking, add 3 1/2 cups beans (reserving one cup of beans), water, tomato paste, vinegar, lime juice, and maple syrup (start with 1/2 tsp). Using an immersion blender, puree soup until fairly smooth. Increase heat to bring to boil, add bay leaf and diced sweet potatoes, then once at boil reduce and let simmer for 20-30 minutes. Add remaining cup of black beans and extra maple syrup if desired (taste test). Stir through, let simmer for another few minutes, then serve, topping with cilantro if desired and with lime wedges. Also delicious to top soup with some chopped seasoned avocado or a simple guacamole. Serves 4-5 as main course. Recipe from “Plant-Powered 15” by Dreena Burton. For more recipes and information, visit www.plantpoweredkitchen.com. I hear her name praised constantly in the plant eating world, but I haven’t yet tried anything of hers. My husband is a picky one so I’m always looking for a recipe author he likes. plainoldsarah You are my winner! Congratulations! Let me know your email and I will forward to Dreena. Congrats on winning! Let me know your email. I checked out her ‘creamy hummus’ recipe. Wayyy too much oil. I’m following more of the Esselstyn/McDougall approach no oil – check out Happy Herbivore and Fat Free Vegan blogs. Thanks for your comment. Yes, I follow the no oil rule too. I just leave out the oil in recipes. Thanks for following.